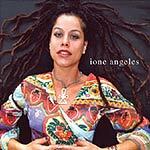 CD review: "Hear This Kiss"
Despite the self-deprecatory lyrics in "Diamonds in the Ruff," there are very few rough edges at all to the singing and songwriting of Ione Angeles' solo debut album. Built around the San Diego-based singer's so-smooth vocals and containing 10 radio-friendly pop songs, "Hear This Kiss" is an independent release just waiting for a savvy record company to snap up. In addition to the pure talent of a singer with a voice and good songs to match there is also this delight to "Hear This Kiss": Even in our age of micro-genres in the music industry, Angeles crosses all kinds of stylistic boundaries. Mostly she's a pure pop singer, but she uses hip hop, sampling, reggae rhythms, rap lines and heavy rock guitar in different songs. She seems to simply take whatever works, and never mind what its label is. Heck, for that matter, she takes a Carpenters' song and makes it hip. "I Won't Last a Day Without You" was a pleasant enough bit of treacle in the Carpenters' hands, but Angeles makes it an uptempo horn-punctuated bit of SoCal soul. But that is nowhere near the best of this album. The opening track, "Standing in Love," co-written by Angeles, has a better melody, more interesting harmonies and, if the lyrics occasionally slip into banality, a more intriguing message. The refrain of "I can love you without falling in love" is fleshed out by the verses to display a philosophical depth not often found in pop lyrics. And the above-mentioned "Diamonds in the Ruff" has an even more hypnotic melodic theme and well-arranged horn charts, while "Not Over Yet" is as pretty a little love song as you could wish for. Not that all is sweetness and light. "Beyond This" is full of jangling attitude, while "Step Up" and "Circle Back" are tough bits of power pop. But the entire album is a gem of mainstream pop music, full of great tunes, positive messages and some top-flight singing.